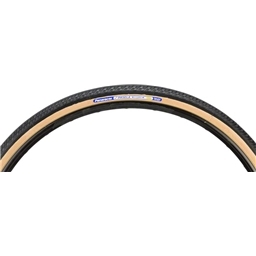 All around touring or commuting tire with ProTite protection, Panaracer's best-ever puncture prevention technology. Its comprehensive size range insures that you can find a Pasela for most any usage. Ride it and trust it. This brand of tire came stock on my Salsa Marrakesh touring bike. As a bike commuter, I love the smooth ride, the trust I have in the tires themselves, and comfort I have in knowing I am traveling on quality tires. I had my fist set for a year and three quarters where I rode my bike daily at least 15 miles. It took a year and a half to get my first flat! The tread finally showed cracking and sun damage, so I purchased a new set. They make me feel like I am riding a brand new bike. These tires are great! When removing the tires, be sure to release the bead all the way around the wheel. By releasing that seal, you'll have a much easier job of removing the tire from the wheel. It's taken a few flats to remember to do that first. If you're looking for quality touring tires, these are the tires you should purchase. I've ridden other tires, but they've never compared to the Panaracers. I'll keep purchasing these tires when they wear out.